Please note that the lecture will start at 4pm sharp this time! Prof. Dr. Sabine Pfeiffer (Professor of sociology with focus on technology-work-society, Friedrich-Alexander University Nürnberg-Erlange): Robots of all countries, unite!? New forms of digitalization on the shop floor – old questions about human work. The robots are here. It has long been obvious that our lives are increasingly being determined by artificial intelligences and autonomous machines. The coexistence of humans and robots is no longer a science fiction vision of the future. Robots have long since found their way into factories, but robots will also play an increasingly important role in leisure time – for example as household helpers or even as social companions. 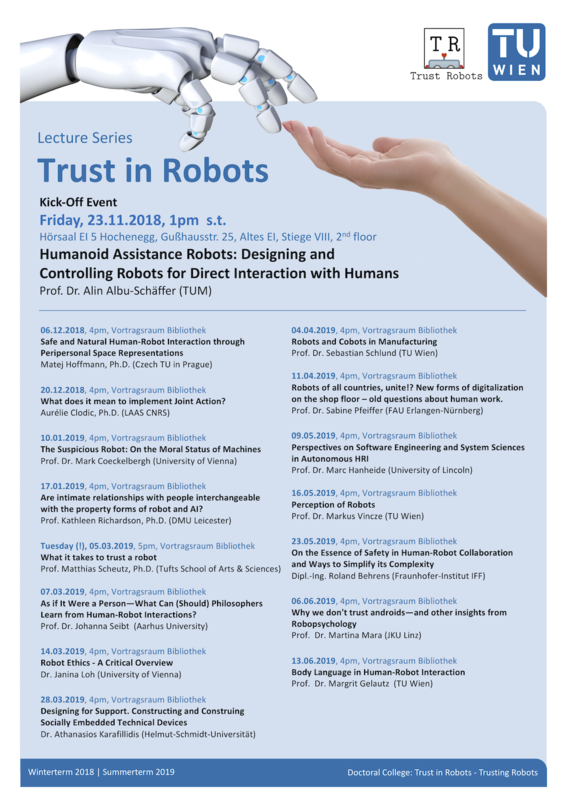 To initiate discussions on the various topics related to trust in robots, the Doctoral College host a series of lectures. These lectures are open to the general public.